* This Blade is Rated for 2WD Tractors up to 160HP & 4WD Tractors up to 145HP. * Good for Category 2 or 3 Hitches. 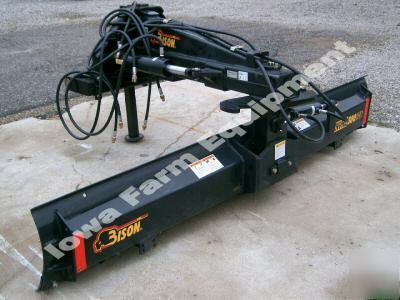 * Blade comes COMPLETE, with 3-Cylinders, Hoses, Hose Tips, Quick Hitch Adapter Pins and a Heavy Duty Parking Stand! * This Heavy Duty Bison Blade Weighs 1240lb's w/o the Cyliners, and 1400lb's with all 3 Cylinders! * King Pin Diameter is 4". * Reversible Blade with factory Bevel on Both Sides. * 0 to 45 degrees (Horizontal Rotation). * Swing Angle Cylinder is; 4" dia x 16" Stroke & 2" Shaft. * 0 to 36" Left or Right. * Offset Cylinder is; 4" dia x 16" Stroke & 2" Shaft. * 0 to 12 degrees Up or Down. * Tilt Adjustment Cylinder is; 4" dia x 4 1/2" Stroke & 1 1/2" Shaft. * This Blade has an Extra Long Boom to accomodate the full 360 degrees of Blade Rotation. Bison is a Top Quality North American Manufacturer and is the OEM for JD's Line of Rear Blades. * Single Guage Tail Wheel. * Mech Linkage for Tail Wheel. * 3X8 Hyd Cyl Kit for Tail Wheel. * Availability can vary from 1 Day to 3 Weeks.